Jack Cranstoun, a much-loved member of the Dispute Resolution Branch, lost his life in October 2014. Mediation level 2 – Development of mediation skills and accreditation assessment. 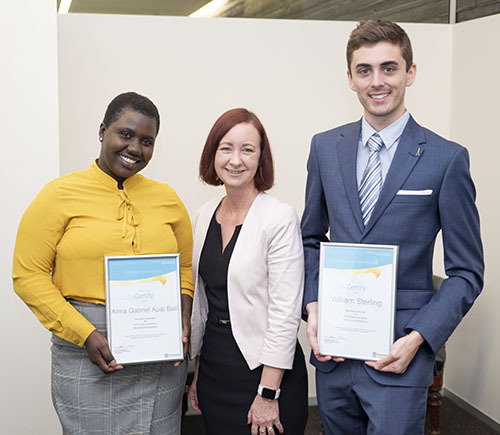 L to R: Scholarship recipient Alma, Attorney-General Yvette D’Ath and scholarship recipient William. (Jodie and Jack were unable to attend). Applications for the next round of scholarships will open in 2020. Follow us on LinkedIn to stay informed about future scholarships or when scholarship recipients are announced. For more information about the scholarship, email trainingdrb@justice.qld.gov.au or phone (07) 3239 6277. 2018 scholarship recipient Michael shares how the skills he gained help his work in Indigenous anthropology. 2018 scholarship recipient Nikola shares some words of encouragement to those thinking of applying.